What is the structure of the inner Galactic bulge? Thanks to VISTA, a 4.1 meter telescope, and its superb near-infrared camera VIRCAM, new observations can be done to help astronomers answer these questions. Even when the Milky Way can be observed by the naked eye from dark places at night, because of our position in the Galaxy, we can actually only see our closest neighborhood. Dust, gas, and stars block the light from other places of our galaxy and thus we are not able to observe far into the bulge, at least in the “visual” part of the electromagnetic spectrum. Previously, all-sky 2 dimensional maps in near-infrared wavelengths have been done with single epoch data. Otherwise, multi-epoch observations have been carried out for specific small field of view targets on the bulge and disk. The VISTA Variables in The Via Lactea (VVV) public survey will perform wide FOV multi-epoch observations of the Galaxy’s bulge and part of the disk, providing the astronomical public community with a high resolution 3-D (or 4-D if you include the time dimension) map of the bulge. This spectacular view of the VISTA telescope was taken from the roof of the building during the opening of the enclosure at sunset. The VLT is visible on the neighbouring mountain. 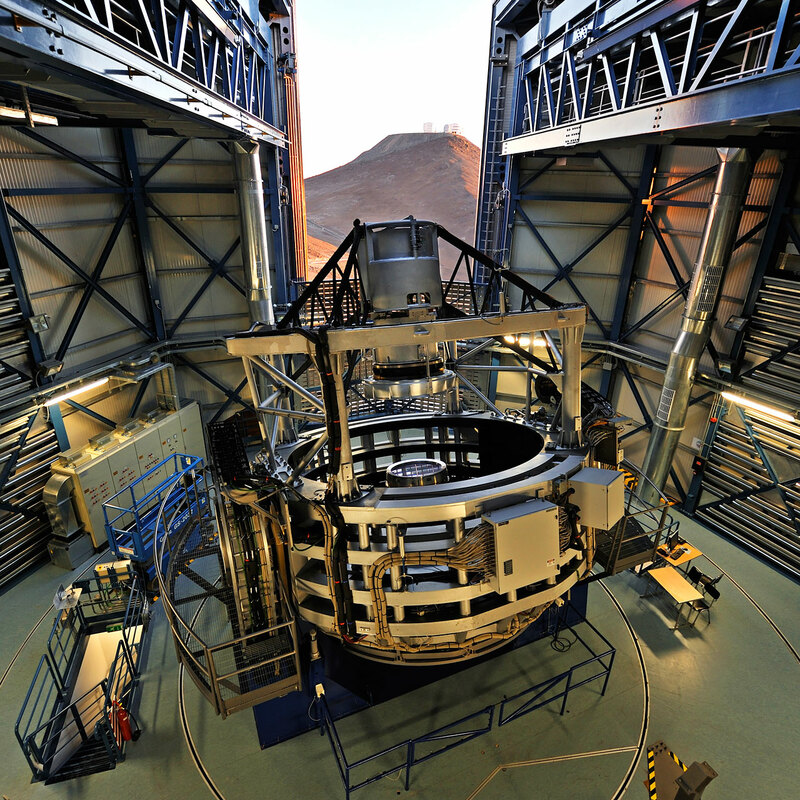 VISTA is the largest survey telescope in the world and it is dedicated to mapping the sky at near-infrared wavelengths. Its primary mirror is 4.1 metres in diameter and is the most highly curved of its size. The extremely high curvature reduces the focal length, making the structure of the telescope extremely compact. VISTA can map large areas of the sky quickly and deeply. Vista Variables in the Via Lactea (VVV) is a public IR variability survey of the Milky Way bulge and an adjacent section of the mid-plane where star formation activity is high. It will take 1929 hours, covering ~109 point sources within an area of 520 sq deg, including 33 known globular clusters and ~350 open clusters. The final products will be a deep IR atlas in 5 passbands and a catalogue of ~106 variable point sources. These will produce a 3-D map of the surveyed region (unlike single-epoch surveys that only give 2-D maps) using well-understood primary distance indicators such as RR Lyrae stars. It will yield important information on the ages of the populations. For the past 6 years, the ESO Public Survey VISTA Variables in the Via Lactea (VVV) has been mapping the IR variability of the Milky Way bulge and southern mid-plane. This public survey project proposes an extension of the previous VVV survey to enhance its long lasting legacy. The proposed VVV eXtended Survey (VVVX) will cover the gaps left between the VVV and VHS areas and extend the VVV time-baseline enabling proper motion measurements of -1 in the optically obscured regions where Gaia is limited by extinction. VVVX will take 2000 hr, and cover 1700 sq degrees in the Southern sky, from l <=130deg to l = +20deg (7 h7 variable sources. Within the existing VVV area we will produce a 5-D map of the surveyed region by combining positions, distances and proper motions of well-understood distance indicators such as red clump stars, RR Lyrae and Cepheid variables in order to unveil the inner structure of the Milky Way. The VVV+VVVX catalogues will complement those from the Gaia space mission with very red sources and will feed spectroscopic targets for the forthcoming ESO high-multiplex spectrographs MOONS and 4MOST.